Goodness gracious, this weekend has been quite a whirlwind of events! I had the immense privilege of watching not one, but two fantastic opening nights at San Francisco Opera – on Friday night, the opera season opened with a lovely production of Verdi’s Luisa Miller, and Saturday evening was none other than the unforgettable Sweeney Todd. Both shows were beautifully sung by some truly world-class singers, and of course, the dancers (my contribution to this whole operation – I played their warm-up classes!) were fantastic. Whew! Since Friday evening was not only opening night, but the opening of the entire season, I knew everyone would be dressed to the nines. Instead of wearing one of my existing gowns from my music school days (which are all a little/lot too tight at this point), I decided I really wanted to make one. So when rehearsals began all the way back at the beginning of August, I began plotting my plan of attack. 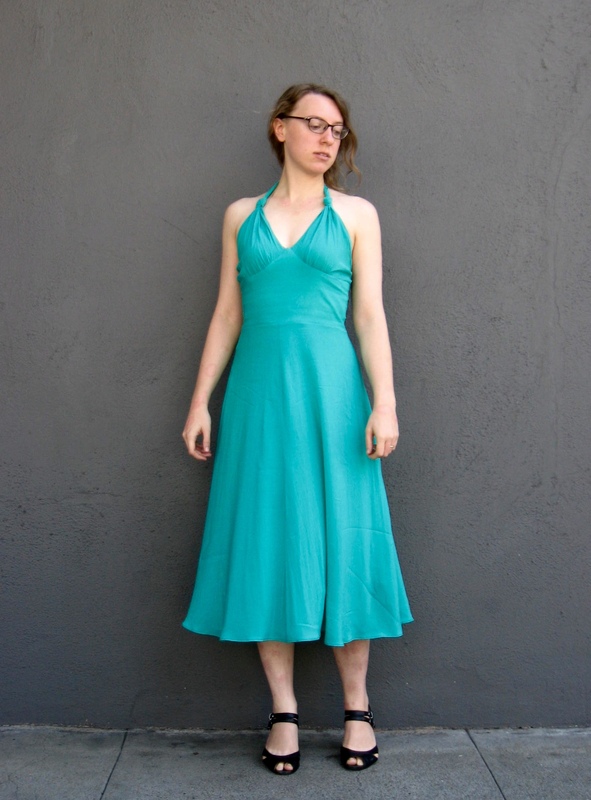 I love a halter silhouette for formal wear, and at first was thinking of using the Sewaholic Lonsdale pattern, but I decided that the back tie detail wasn’t quite what I was looking for in this particular dress, as I think it lends a more casual element to the design. 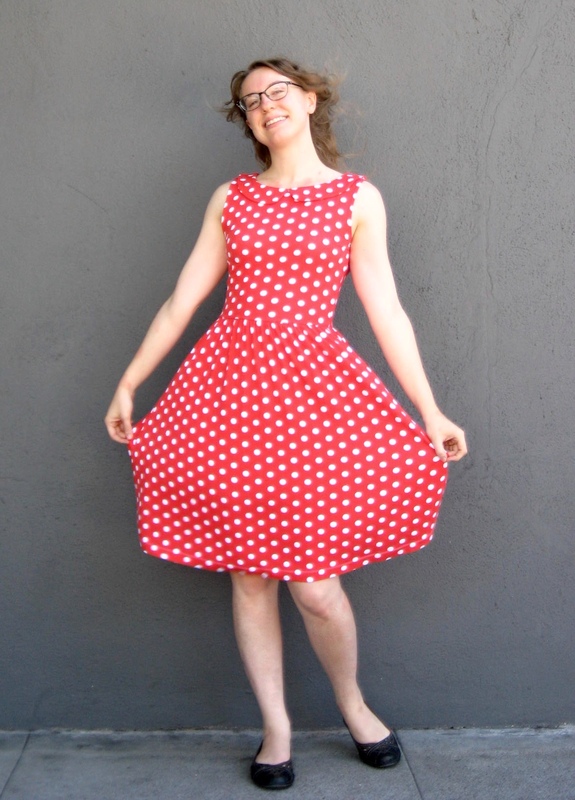 I eventually landed on the Ava dress from the book Famous Frocks: The Little Black Dress, using the Lonsdale skirt in place of the bias cut skirt in the pattern. The fabric is a rayon batiste from fabric.com, which I had originally intended to use a lining to my trench coat. Since it bled terribly after several washings, I realized it couldn’t be used as a lining, but would make a lovely flowing dress all on its own. Cutting it out was pretty tricky – the fabric is very thin and shifty. I probably should have just used starch or gelatin to stabilize it, but since I was working with a LOT of yardage, I didn’t know how that would turn out. So instead I taped the yardage to my wood floor to keep it on the straight of grain and slid my cutting mat underneath, using a rotary cutter to avoid distorting the fabric as much as possible. It wasn’t a perfect process, but it got the job done! I then took my sweet time sewing it. In fact, this was supposed to be a wearable muslin for a different fabric, but I put so much work into it that I decided to just used this as my final dress! And, of course, since I spaced out my sewing so much, I ran into several near-disasters at the last minute that nearly ruined the project. I managed to get a stain on the center front of the bodice right before I was going to insert the zipper, and spot cleaning just created huge water marks. So I ended up inserting the zipper and then washing the whole thing – two days before I wanted to wear it to the opera. Good thing it dried quickly!!! Fit-wise, it definitely could use a few tweaks for next time. You can see from the side views (which I promise you’ll see shortly…) that I had to take pleats out of the underarm area of the main bodice piece, since it gaped horribly (like, showed everything) when I first tried it on. To fix that for next time, I want to try to slash and spread the pattern itself to remove the excess fullness, which I think should create the equivalent of a SBA for this style. I just used the pleats here because I wanted to salvage the dress if possible! All things considered, I really enjoyed wearing this dress to opening night. Everyone really was dressed to the nines – full-on ball gowns and tuxedos! This dress is elegant in its simplicity rather than its complexity, so I didn’t feel out of place even in the midst of so much glitz and glamour. It truly was a night to remember! There’s nothing quite as wonderful as a great summer dress – something that keeps you both cool and cute during those hot, sweaty days! Even though summer is drawing to a close, I still find myself wearing a fair amount of summery garments (layered with cardigans, etc., for colder weather), and this dress is no exception. 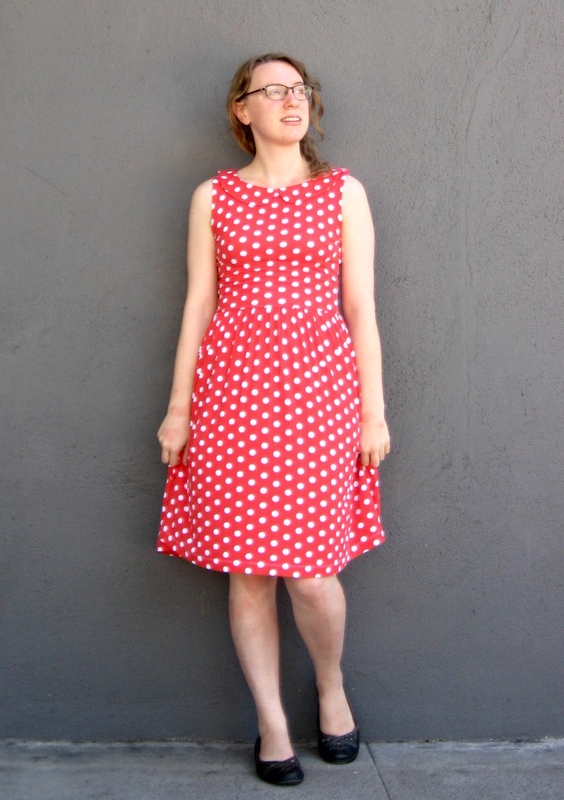 It combines pretty much everything I could want in a summer dress – knit fabric, a swishy skirt, and POLKA DOTS! Did I mention polka dots?? 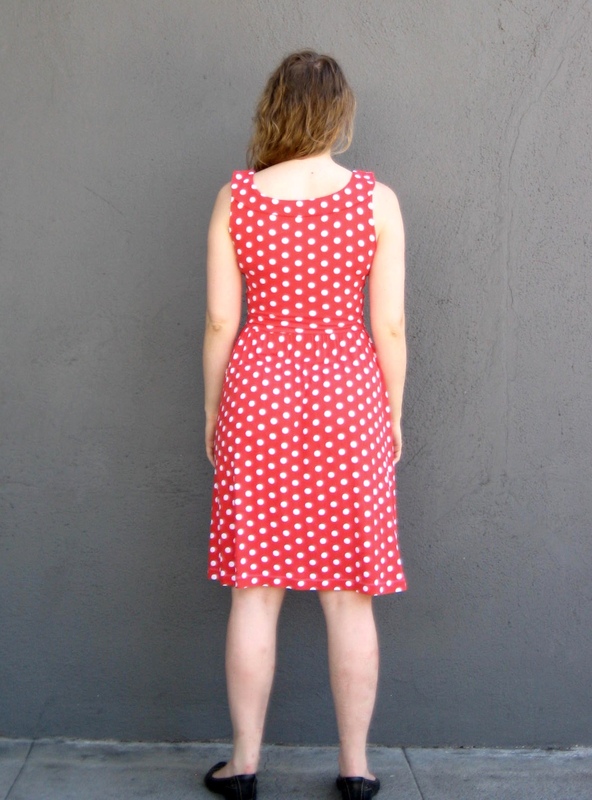 If you haven’t figured it out already, this is the Moneta Dress by Colette Patterns – my current favorite knit dress pattern. I really love the bodice shaping and gathered skirt, as well as the different collar options. It’s difficult to tell in this pic, but I used the Peter Pan collar option for this dress. It’s a little overboard on the cuteness meter, but personally, I love it. The loud polka dots and collar combined kind of remind me of Minnie Mouse. In a good way. In terms of construction, there’s really not a whole lot to say here. I did a slight sway back adjustment, which I may need to augment, judging from these photos (I think the fabric has stretched a bit with wear, as these photos were taken a month or so after I finished the dress). For the collar, I sewed the pieces together on my regular sewing machine instead of the serger so that I could notch the curves and get a cleaner line. 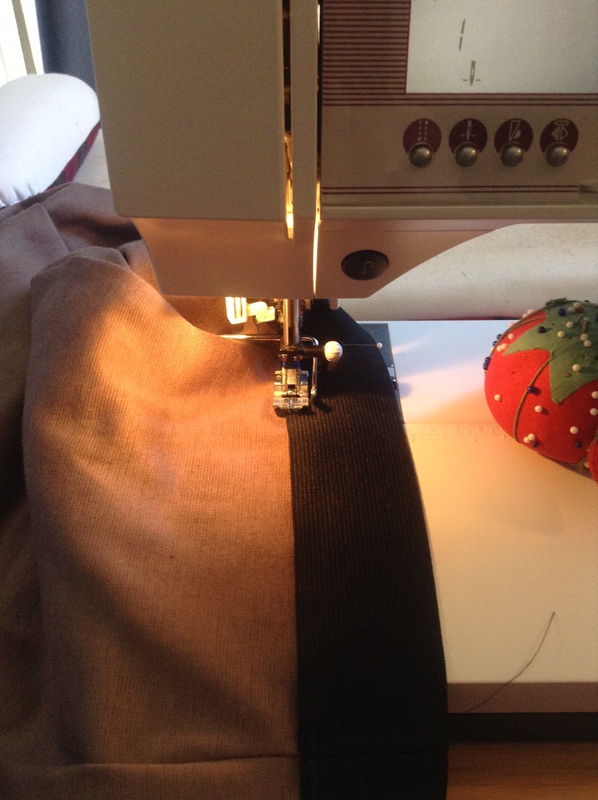 I’m really pleased the the result – I would highly recommend sewing all of the collar options on your regular machine for precision, even if you used your serger for the rest. One last construction note – I always gather my skirt with long basting stitches (the “usual way”) before adding the clear elastic to the waist. I’ve tried the whole elastic ruching thing several times, and not once has it worked for me. My method take a little longer, but I think the results are worth it. The fabric is a nice rayon knit that I actually got from Sally over at The Quirky Peach when she had her summer stash Instagram sale. I thought that was such a fun way to destash and reach out to the online sewing community simultaneously. And I got a ton of awesome fabric at an amazing price!! All in all, this is definitely one of my favorite makes so far this year. It does exactly what I want/need it to, and I imagine I’ll probably end up wearing it to pieces in the next year or two. Woot!